Alex Lattner will be leaving the University in early summer to begin a position in New Hampshire. Please join us TODAY - May 2 - from 1:30-3:30 p.m. in the registrar's office as we say farewell! 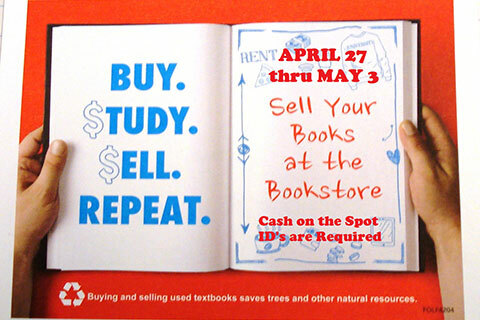 Semester ending Book Buyback at the UE Bookstore runs during finals week, April 27-May 3. We freely quote prices on any books you might want to sell regardless of where purchased or if used on this campus or not. You'll get cash on the spot! Please bring your student ID with you, you do not need your original receipt. We've got loads of books we're buying at special prices so just stop in and check pricing. The UE Bookstore is offering 20 percent OFF all clothing and gift purchases during Buyback Week, April 27-May 3. NIKE and Under Armour merchandise is 25 percent OFF during the same time. Clearance items are exempted from additional discounts. Stop in the bookstore and save before the year is over. The University of Evansville's 159th Commencement ceremony will take place this Saturday, May 6, at the Ford Center in downtown Evansville. The ceremony starts at 1:30 p.m. and our annual Baccalaureate service will be held at 10:00 a.m. Saturday in Neu Chapel. The event will feature the Senior Keynote address, presentation of the University of Evansville Alumni Association’s Outstanding Teacher of the Year award, Eykamp Prize, as well as the Outstanding Senior Service Awards. A video of the Commencement ceremony will be posted on this page in the coming weeks. Additionally, you can follow along and post on social media using #UEGrad17. All graduates and their families are invited to attend the 2017 Interfaith Baccalaureate Service this Saturday, May 6 at 10:00 a.m. Baccalaureate is a religious service that gives thanks to God and offers prayer for the graduating class in the context of sacred ceremony. President Kazee will be offering words of wisdom, the University Choir will be singing; Board of Trustee members will be processing with faculty and administrators; and 2017 graduates will be participating in the service. 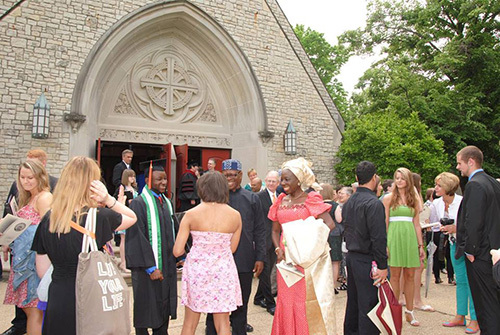 Graduates are invited to participate in the Baccalaureate service by wearing full regalia (cap, gown, and honors cords), and processing with faculty, members of the Board of Trustees, President Kazee, and other guests. Graduates, if you have not registered yet, you are invited to do so by going to the Baccalaureate web page so that the appropriate number of seats may be reserved. Please note - University Choir members who are graduating are invited to register and wear full regalia. Families are encouraged to arrive by 9:30 a.m. in order to get priority seating. Neu Chapel is always full for this special celebration. The University of Evansville Friends of Art invites you to Painting with a Twist on Thursday, May 4, from 6:00-8:30 p.m. in the Melvin Peterson Gallery. Come paint a one-of-a-kind creation and learn about the style of artist Van Gogh. The cost is $35 for UE Friends of Art or $45 for non-members. Sign up to become a member of UE Friends of Art and pay the reduced member fee for the event. Contact Michelle at dh196@evansvillle.edu to register by May 2. On Monday, May 22, the annual Purple Aces Club Golf Outing will again take place at Oak Meadow Country Club in Evansville. Foursomes are available for $600 while individuals may register for $150. Your fee includes a boxed lunch, drinks, Aces NIKE polo shirt, and post-golf hors d’oeuvres. Registration on the day of the tournament starts at 11:00 a.m. before a shotgun start commences the action at noon. Following your round of play, a reception will take place from 5:00-6:00 p.m. with the awards ceremony taking place at 5:30 p.m., inside the clubhouse. The fun and fast-paced format is a 4-person scramble where everyone hits off the tee, but only three players play into the green, with the person whose tee shot is utilized sitting the next shot out. Multiple tee boxes will be used where you start on the regular tee, move back after a birdie, eagle or double eagle, up for a bogie or worse, or for two consecutive pars. All players will putt with a 2-putt maximum on the green. Mulligans will not be utilized; instead a length of string will be provided to each team to make the putt without an additional stroke. Once a length is used, it cannot be reused. Additional lengths may be purchased. Several great sponsorship opportunities are available and start out at just $150. Hole sponsors cost just $150 and include a sign on a tee or green. Three $250 opportunities are available: longest drive sponsor, closest to the pin sponsor, and cart sponsor. The chance to sponsor the reception is available for $1,000 while an event title sponsorship can be purchased for $2,500. To register for the event, visit the Purple Aces Golf Classic web page. For more sponsorship information, contact John Rodgers at jp295@evansville.edu or 812-488-4288. Students at UE are in the process of starting a Lilly Scholars Network Chapter and are in need of an advisor! If you are a faculty or staff member on campus and interested in serving as the group’s advisor, please send an e-mail to mh445@evansville.com. Thank you! Head over to the study abroad web page to read about Kellie Garrison's study abroad experiences in Italy! Kellie, a third year DPT student, has some great stories about the relationships she's formed, the trips she's taken, and the wonderful Italian food. Want a copy of the 2016 LinC? About 10 copies of the 2016 LinC remain and are available to those wanting a copy. Pick up your copy of the yearbook outside of student publications. First come, first served! Questions? E-mail Erin Lewis at EL131@evansville.edu. Ace’s Place will close for the summer at 2:00 p.m. on Tuesday, May 2. Café Court will close for the summer at 5:30 p.m. on Wednesday, May 3. Jazzman’s will close for the summer at 2:00 p.m. on Tuesday, May 2. This is a reminder to all UE students who rented books from the UE Bookstore for the Spring 2017 term that those rentals are due back in the store no later than 5:00 p.m. on Wednesday, May 3. Avoid late charges and return on time. If you have questions please contact the UE Bookstore. Important mail notice for students living in UE housing! The last day for mail delivery and pick-up by mail services for all students living in UE Housing will be Wednesday, May 3. Students are asked to review the Office of Residence Life website’s on-campus services-mail services link prior to departure from UE campus. Also, students are strongly encouraged to contact financial institutions directly regarding mailing address changes. Please note that UE is not responsible for fines or penalties due to delayed mail delivery. Those anticipating packages shipped via couriers (FedEx, UPS, DHL, USPS, etc.) that may arrive after their departure, should contact UE mail services to make arrangements to pick-up these items prior to leaving UE. Please note mail services will not be able to forward items. Please contact UE mail services with questions or concerns via e-mail at mailservices@evansville.edu or phone 812-488-2197. 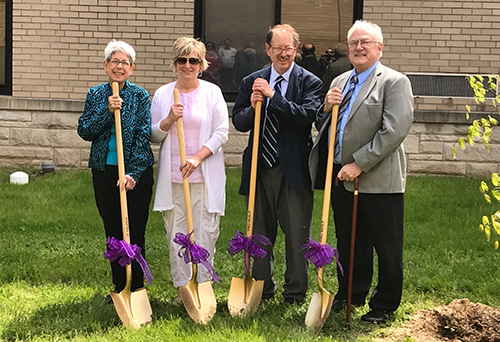 Tink Martin, Janet Szczepanski, Gifford Brown, and Renatto Butturi were the guests of honor on Sunday, April 23, at the annual Tree-Planting/Retirement Reception. Patti McCrory and Mike and Molly Zimmer are also retiring this year, but were unable to attend. We wish them all the very best in their retirement. 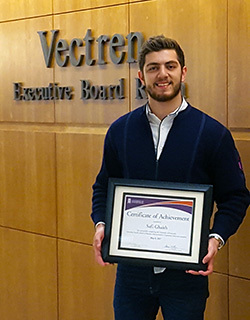 Ghaith Safi, a Schroeder School of Business finance major, has accepted a full-time position in Fifth Third’s wealth and asset management leadership program in Cincinnati, Ohio. Safi has already completed two internships with Fifth Third, working in Evansville, Lexington, and Cincinnati in a number of roles including retail, commercial, and investment decisions. One highlight of his internships with the bank was delivering a presentation to Fifth Third CEO Greg Carmichael. The Schroeder School of Business is ranked tenth among small private business schools by US News & World Report and is ranked first among over 500 small universities for accounting and finance programs. UE Schroeder Family School of Business Greg Rawski has published a journal article, “User Engagement in Social Media,” in the International Journal of Information Technology and Management. The University of Evansville’s Professional Athletic Training Program has been granted five-year accreditation by the Commission on Accreditation of Athletic Training Education (CAATE) with the next comprehensive review occurring during the 2021-22 academic year. .
UE hosted a site visit with a CAATE review team in January after an intense period of self-study, which began in the fall of 2015, and a self-study application that was submitted June 1. The site visit team reviewed extensive reports and interviewed members of the athletic training team to evaluate and verify the institution’s ongoing ability to meet the standards for accreditation. The UE athletic training program is now one of only five schools in the country that has an accredited program at both the master’s level and bachelor’s level, giving students’ options for pursuing their athletic training degrees. The athletic training program utilizes three universities and colleges, three out-patient rehabilitation clinics, and eleven high schools to provide their students with clinical placements within the Evansville area. 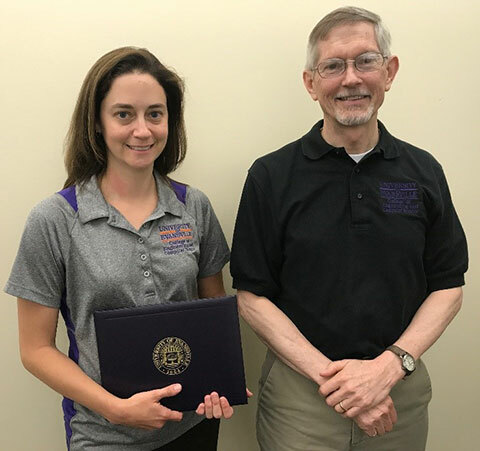 “We recognize the faculty, staff, and administrators at the University of Evansville for their commitment to the advancement of education in athletic training, as well as the dedication to the preparation of qualified athletic training professionals,” said a representative from CAATE. The University of Evansville is the smallest Division I CAATE-accredited school in the country. Athletic training students are challenged with rigorous course work and hands-on experiences, such as their involvement with UE’s Division I athletic programs, from their first week on campus. University of Evansville athletic training students have the flexibility to explore many branches of study and develop diverse skill sets through the athletic training, physical therapist assistant, pre-physician assistant, pre-med and Doctor of Physical Therapy-combination degree programs. Megan King has been awarded the 2016-17 Wesley T. Milner Distinguished Senior Award of International Studies Program. The newly established honor is awarded annually to the outstanding senior of International Studies major. The award is named for the former director of the International Studies Program, Wesley T. Milner, in honor of his dedication in the IS program at UE for over two decades. UE vice president of academic affairs and Title IX officer Tracey Folden has been named to the 2017 class of the Henderson County Sports Hall of Fame. Folden is a 1992 graduate of Henderson County High School. She won the indoor state championship in the 55-meter dash at Mason-Dixon Games. Folden was the anchor of the 4x200 relay team that still holds the school record that was set in 1989 and was part of the 4x100 relay team that held the school record for 15 years. She also held the school record in the 200 dash that stood for 27 years. She continued her track career at Western Kentucky University. The College of Engineering and Computer Science congratulates Christina Howe, associate professor of electric engineering, on receiving the Dean’s Outstanding Teaching Award for 2017. Howe serves as the UE chapter IEEE advisor and SWE co-advisor. She is also the Indiana Space Grant representative for the college and serves on the board of directors for the Indiana Girls Collaborative Project. 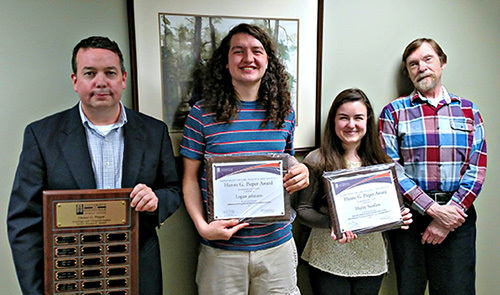 The Biology Awards Reception was held on April 26 to honor the outstanding achievements of UE biology students during the 2016-17 academic year. The James A. Brenneman Student Service Award in Biology was given to Brooke Wininger, and the Patricia L. Akrabawi Teaching Assistant Award in Biology was presented to Andrew Nunn. These awards are named in honor of retired professor Jim Brenneman and Pat Akrabawi, respectively, for their long and generous commitment to UE biology students. The Jerry T. Seng Freshman Biology Award recognizes retired faculty member Jerry Seng for his years of tireless devotion to the success of biology students, especially the freshmen class. The recipient of the most outstanding freshmen award was Skip Maas. Colton Houchin received the David and Jennifer Pollock Sophomore Biology Award, named in honor of David and Jennifer Pollock (’78) for their generous support and contributions to the biology department. Josh Baty received the P. “Louie” Winternheimer Junior Biology Award, named in memory of Louie Winternheimer for his 39 years of distinguished teaching and service at UE. The outstanding senior award is named in honor of UE benefactors Dr. and Mrs. Robertson. 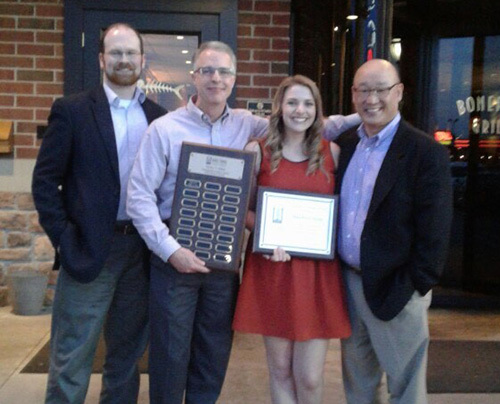 The Charles and Patricia Robertson Senior Biology Award was presented to Shelly Sonnenberger. 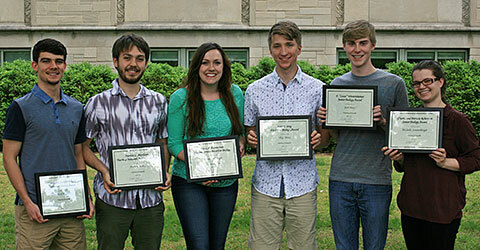 Congratulations go out to all of the biology majors for their success over the past academic year. James DeSilva has received a teaching assistantship in the German studies graduate program at Vanderbilt University. He will begin in the fall of 2017. The History Department of the University of Evansville would like to congratulate Mitch Rick and William Glasscock on their acceptance to law school. Rick received a full tuition scholarship to attend the John Marshall Law School. Glasscock received over $50,000 in scholarship support to attend the Southern Illinois University School of Law. The history department is proud of Mitch and Bill and our many alumni who graduated to pursue the law. Senior sociology major Logan Johnson and senior international studies and criminal justice major Hayley Serafino have been awarded the 2006-17 Hanns G. Pieper Sociology and Criminal Justice Senior Research Award. The honor is awarded annually to the outstanding independent research project conducted, written, and presented by a major in sociology, anthropology, gerontology, and criminal justice. Johnson’s senior research project was entitled “Influences on Perception of Authenticity in Sports Fandom;” this fall, he will be pursuing a graduate degree in film and media arts at Southern Methodist University in Dallas, Texas. Serafino’s senior research project was entitled “Views on Criminals and the Criminal Justice System: The Differential Treatment of Terrorists and Traditional Offenders;” this fall, she will be pursuing a graduate degree in security studies at Georgetown University in Washington, DC. The award is named for emeritus professor of sociology Hanns G. Pieper in honor of his foundational work in the program’s research sequence and for his dedication in promoting independent student research in sociology and criminal justice at UE for over two decades. Congratulations to the commendable faculty members who received Dean's Teaching Awards from the Academic Deans for 2016-17. Kathy Liu, assistant professor of exercise science and athletic training from the College of Education and Health Sciences. The Task Force would like to thank all the folks who contributed answers to the survey questions, we very much appreciate your contributions. There were numerous insightful recommendations; recycling and energy efficiency were two of the most popular topics. The survey helped to communicate a need for greater education about sustainability initiatives already happening on campus. The task force looks forward to increasing education and awareness. There were also a number of areas for growth identified, which will be outlined in the strategic plan that will presented to President Kazee in late Fall 2017.